SARAH Ferguson, Duchess of York, has been pictured enjoying a family day out at Royal Ascot with her daughter Princess Beatrice and her estranged husband Prince Andrew for Day 4 of the races. Sarah arrived wearing a navy outfit while Princess Beatrice wore a demure cream dress and hat for the races in Bershire. The pair gave a curtsy as the Queen as she arrived in the royal procession, which marks the start of the races. Sarah was later pictured in the royal box laughing with the Queen and having a right royal time with Her Majesty. The Duchess of York was married to the Queen’s son Prince Andrew in 1986 and despite separating in 1986 the pair have remained close. 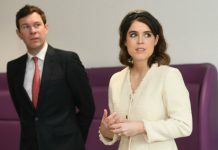 Noticeably absent from the family event was Beatrice’s sister the bride-to-be Princess Eugenie, who will marry Jack Brooksbank in the second Royal Wedding this year in October. Both Beatrice and Eugenie attended Day 1 of Royal Ascot, arriving in the royal procession with Prince Charles and Camilla, Duchess of Cornwall. 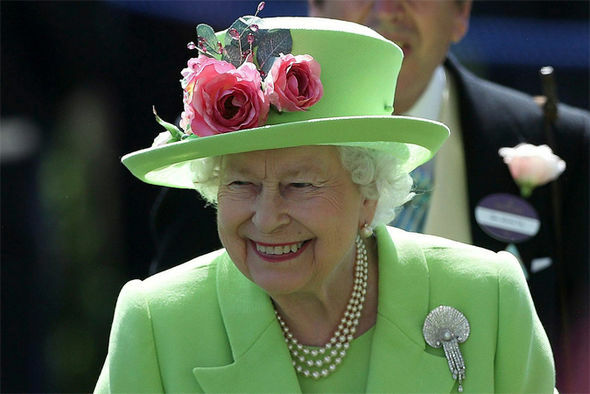 Today the Queen led the procession wearing a beautiful bright green outfit and hat, with echoes from the first Royal Wedding and her outing with Meghan Markle last week. 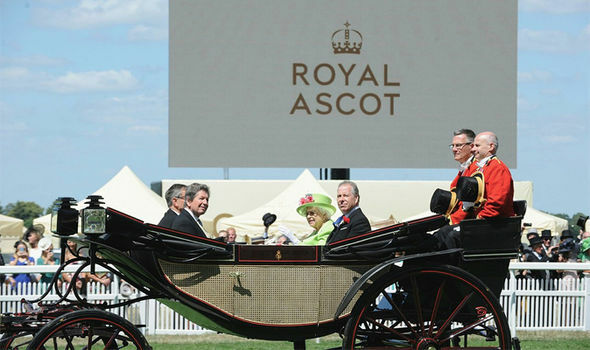 Royal Ascot is the Queen’s favourite week of the year with several of Her Majesty’s horse entered in this year’s races. She spoke fondly of the event in the foreword for this year’s programme, saying: “My family and I greatly look forward to Royal Ascot. Meghan Markle made her Royal Ascot debut on Day 1 with Prince Harry and the new Duchess of Sussex appeared fairly relaxed for her first day at the races. Meanwhile, Harry was absolutely besotted with his new wife and the pair appeared attached at the hip for most of the day. In one touching picture from the day, the Harry could not let go of Meghan’s hand as he stretched to shake the hand of a winner. The new Duchess of Sussex, who looked stunning in a stylish monochrome outfit by Givenchy, even received a kiss from Frankie Dettori, who won on horse Without Parole. The Queen has so far attended every day of the five-day event. Princess Beatrice wore a beautiful pale blue dress for Ascot Day 1, while Princess Eugenie looked ever the part of the blushing bride-to-be in a pale eggshell blue dress. The Princesses also attended Ascot yesterday for Ladies Day, but today is the first day Sarah Ferguson has attended this year. Both Princesses chose monochrome outfits for the day as they arrived in the royal procession with Princess Anne and her husband Sir Timothy Laurence. Princess Beatrice presented the winner of the Hampton Court Stakes jockey Ryan Moor with his 50th Ascot win yesterday. Previous articleMeghan Markle and Prince Harry: Expecting a Boy AND a Girl? !